Part of what I love about the area around Downpatrick Head is that you can walk down to the shore and investigate all the tidal pools. It’s rock, so no sandy beach to play on, and I’d not swim there, either with the crashing waves. Unfortunately I was there at a higher tide than last year, so I couldn’t walk out on the rocks half as far as I hoped. I was really worried I’d miss the sea-life I’d seen last time. I still got a little bit. 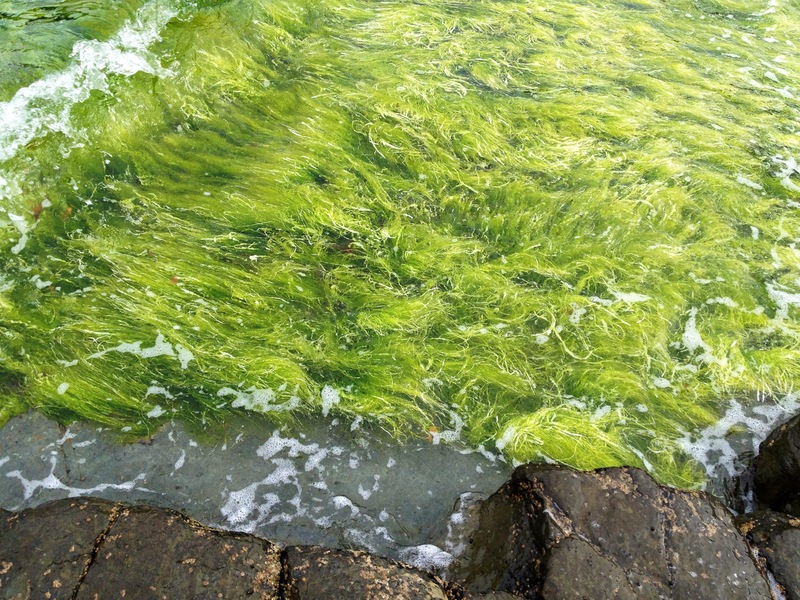 Sea grass flowing in the current. 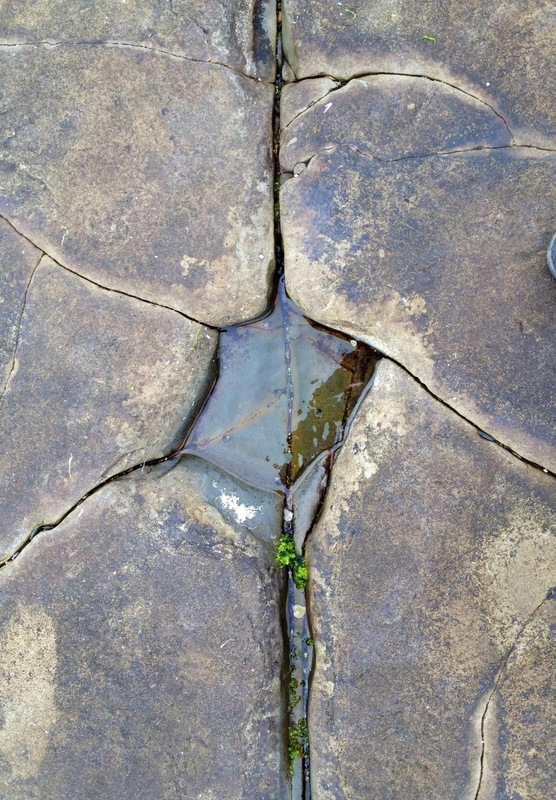 The cracks in the rock surface were so very straight. I loved the miniature pools left in the hollows. 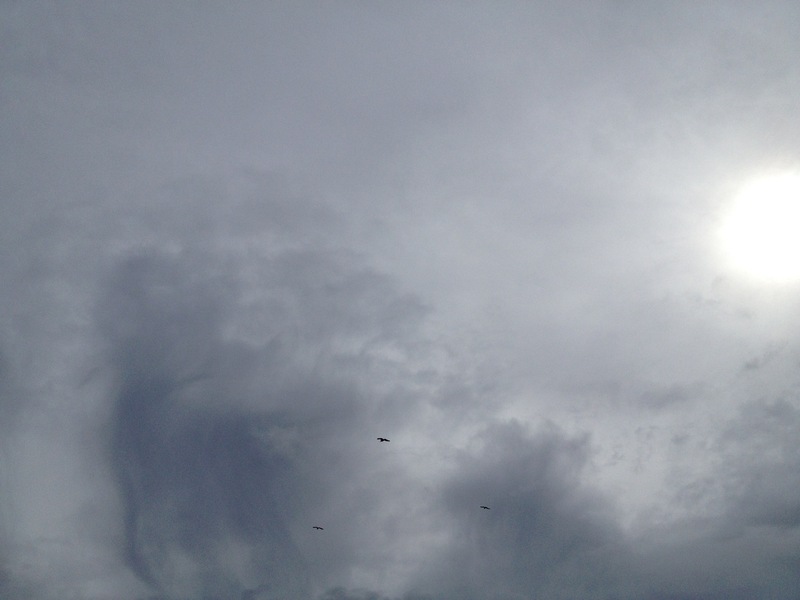 Seagulls riding the updraft above us. I wonder what the broken bits are. Looks like fan coral, maybe? It was so pink compared to the stone and the blue of the mussels. But this – this is what I was seeking! 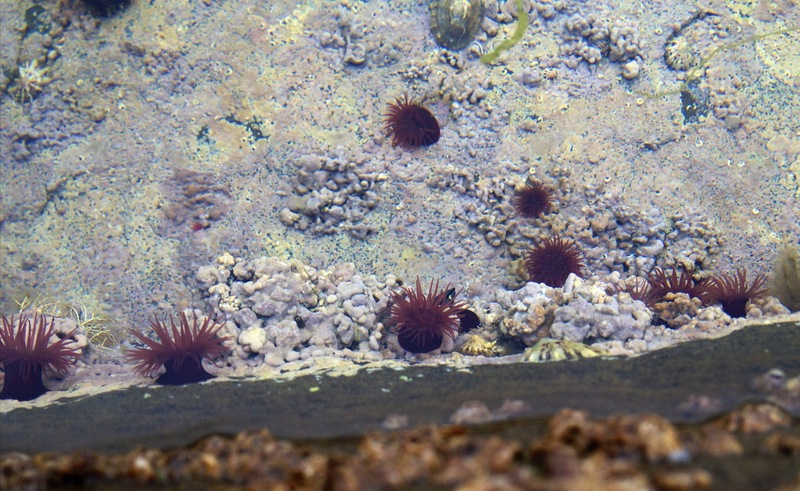 Tiny little sea-anemones. Aren’t they lovely? 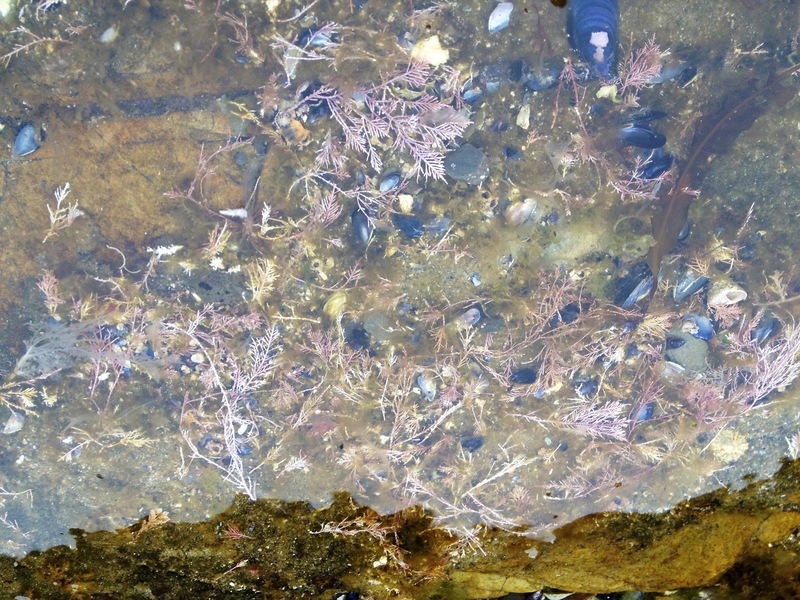 I didn’t find a live starfish, or an empty urchin shell, like I did last year. 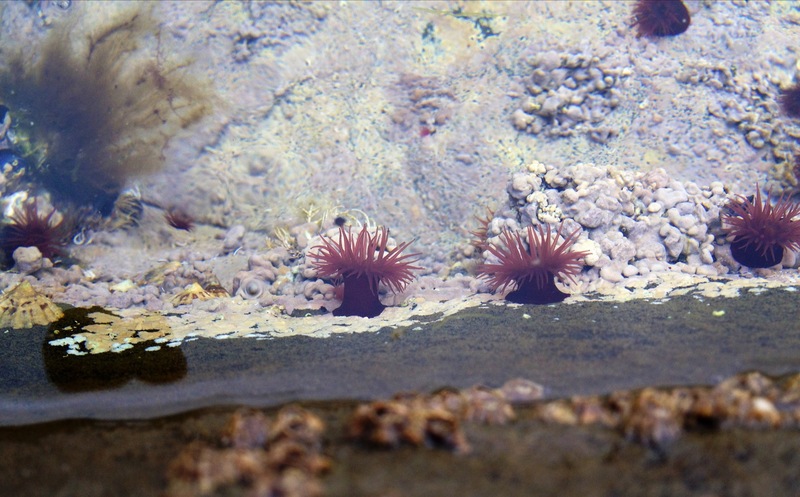 But I was happy to see the anemones. They were only a tiny bit below the surface, and I have to admit I did tickle one to see what it felt like. Reminded me of the touch of a tarantula’s foot – sticky without leaving any goo behind on your finger. Like each waving arm grabbed on to me, and then decided I wasn’t food and let go. I also learned a good lesson on photography – when taking pictures of something underwater, shadows are your friends! These would have been immensely clearer if I’d blocked the hazy sunshine with my body. I’m just so used to not doing that, I never even looked at the phone to see the results of my efforts. Next time! Lovely! 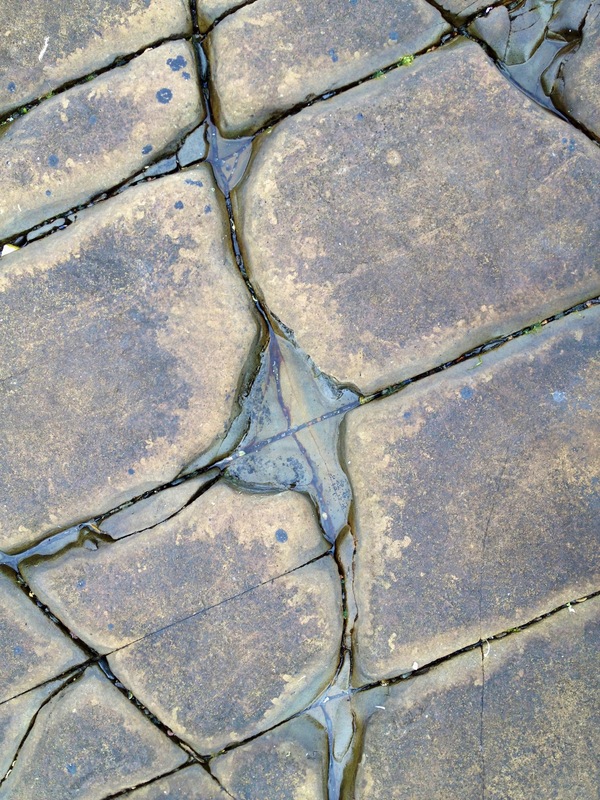 I especially like the straight cracks in the rocks…..natural scenery is just thought provoking sometimes! I found them fascinating, too – not used to such straight lines in stone – or in nature. Nature may be mystifying, but these wonders are usually from easy-to-explain, and magic-breaking explanations. I don’t have a big picture to confirm and I don’t know the geology at that particular place. But here is my guess. I believe these rocks were facing the other way at some point in the past. That is, what is now the top was a side. They were formed by dust, sand and debris over million of years, and the persistent pressure over them was so that they became rock over time. These straight cracks are likely marks of past events, and apparently something that happened at quite a regular interval. Maybe a volcano which erupted every few thousand years, and which dust couldn’t stick and form into rocks? Maybe even these are witnesses of the past ice ages? Here in Gaspésie, several spots have rocks that look like razor blades facing up, with a small angle, right next to the beach and underwater, occasionally emerged during low tides. Looking up, you can tell where these are from, as you can see the cliffs are made of these. All of these cliffs were underwater in the past, but hundreds of ice ages pushed them up, and actually formed the Gaspésie peninsula (today a mountain, but it wasn’t even emerged before the last ice age). As I was taught, these blades each represent one year of rock formation. Each year, there was a period when sand and dust would collect and later form rock, but winters prevented the collection and would instead leave stuff that couldn’t be made into rock. Looking (and stepping on) these blades in the sea (not barefoot, you would really cut yourself, these are quite sharp despite years of erosion) you can admire a few thousand years of nature’s hard work, a small slice of history dating million of years ago, pushed out by icebergs for us to see. Yep, I just broke the magic. But to me, this is actually the interesting thing. Yes, it is beautiful, but I’m never satisfied if I don’t know. It unnerves me that you know what a tarantula’s foot feels like. Haha that’s exactly what I thought. I love nature, I love all creatures, but these 8-hairy-legged creatures are not my thing. I better watch them through a pane of glass, which is not located under my roof. Plenty of sea life round where I am, but if you stuck your finger in a jelly fish I’d probably faint. The little sea anemones are cute tho. Yeah, I’m not THAT adventuresome. I grew up with Portuguese Man o War on my beaches – you learn right quick not to touch anything jelly-like! In aquariums, we are taught to use rubber gloves (the kind old ladies use to wash the dishes) before any manipulation of these animals. Latex gloves aren’t even sufficient. Thank you! I could spend all day there. Those are great photos. I’d have taken a hundred! I love the detail of the rocks. I didn’t want to bore my friend with a lot of photography. I also didn’t bring the fancy-pants camera and filled up my phone! Yikes.